Credit: ASLA 2016 Professional General Design Honor Award. Bishan-Ang Mo Kio Park. Ramboll Studio Dreiseitl / Lim Shiang Han. Every April is World Landscape Architecture Month (WLAM), when students and professionals from around the world work to promote the best of what landscape architecture has to offer. Born from the need for public outreach for the profession, the celebration quickly evolved from a national to an international platform, and has since created a greater appreciation for landscape architecture through social media and networking. To build on the success of last year, the April subscriber’s print edition of Landscape Architecture Magazine comes with cutout cards reading “This Is Landscape Architecture” to take pictures with that favorite landscape and share on social media using the hashtag #WLAM2016. 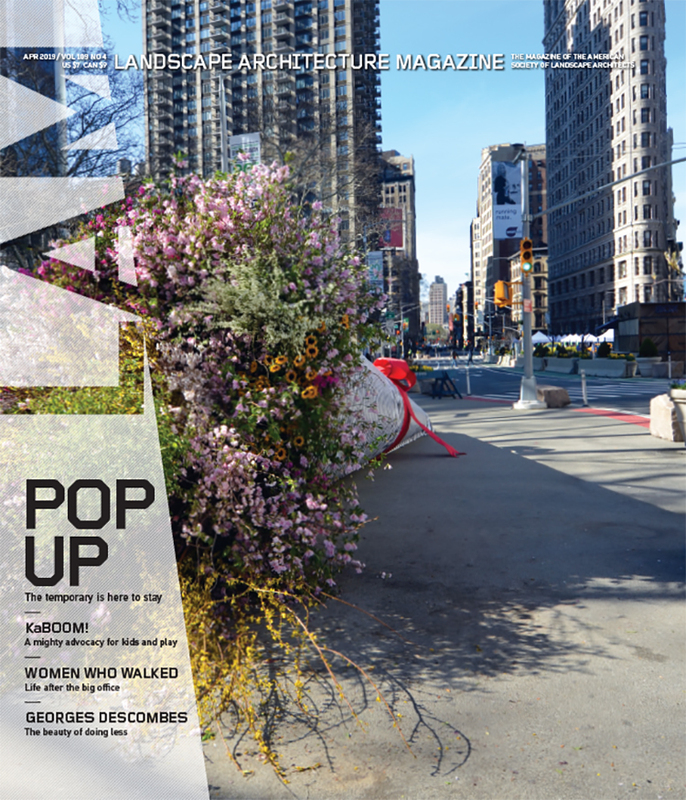 And this month’s digital issue of LAM is free in celebration of WLAM to share with friends, coworkers, and the odd family member who still thinks landscape architects mow lawns. For more information on World Landscape Architecture Month and how to get involved, please visit here. The demolition of the interior of ASLA’s headquarters has finally gotten under way, marking a major first step in creating the ASLA Center for Landscape Architecture in the heart of Washington, D.C. Members of ASLA’s executive committee and staff joined in knocking down the first wall, with President Chad Danos, FASLA, taking the inaugural first swing. Demolition continues until late March when construction will begin. The renovation, designed by Gensler and Oehme, van Sweden, is expected to continue through late summer. Pledges contributing to the project have reached 66 percent of the $1.5 million goal, and continue to grow through the generosity of members and many other friends of the Society. For more information, and to donate, visit cla.asla.org.